1/2 cup of boiled water , should be sufficient to make a dough. First of all mix salt or sugar with rice flour. Then add extremly hot water on it and stir slowly with the spatula. The add some chopped nuts or you can add some til on it and make a soft dough. Then make a desired shape and put that on steamer, cook for about 15 minutes. Serve with aluko achar or any gravy type of curry or with honey for the children. 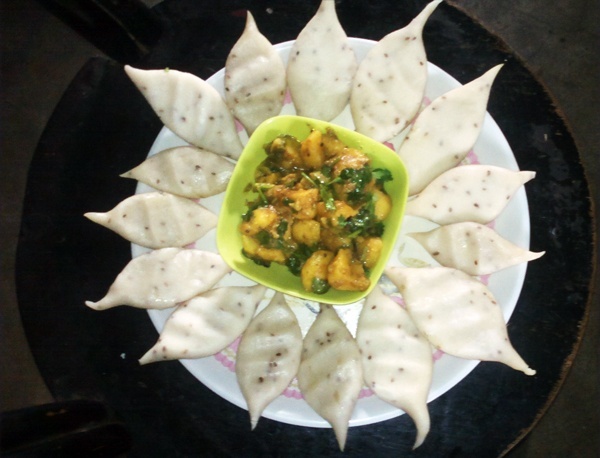 This entry was posted in Rice, Snacks & Appetizers by Kamakshi. Bookmark the permalink.